Utopia – A Picture Story, is a collection of 88 silk batik works by artists from Utopia in the eastern region of Central Australia. Utopia lies 250 kilometres north-east of Alice Springs and was formerly a pastoral leasehold running cattle before being returned to its traditional owners in the 1970s. In 1977 the women from Utopia, attended a bush workshop to learn about batik. This was their first experience with non-indigenous materials and techniques. The following year the women formed the Utopia Women’s Batik Association which became known for beautiful, fluid designs on silk featuring imagery based on ceremonial Awelye. Eighty-eight artists were involved with the original project, Utopia – A Picture Story, completed during Australia’s Bicentenary in 1988. While this project evolved independently from this national celebration, it nevertheless expresses an important symbolic message about cultural autonomy and survival. The significance of this project is a powerful collective statement by the members of a traditional community. The works in the exhibition represent the turning point for the Utopia women artists as they heralded the changes which have firmly established them, and the Western Desert art movement, in the contemporary arts scene. These works convey the knowledge of and respect for country, and use imagery of their ceremonial designs to encompass the perspectives of the women. Utopia is home of the Anmatyerre women artists, including Emily Kngwarreye, Gloria Petyarre, and Ada Bird Petyarre, who have since entered the lexicon of great Australian painters. Apart from two images, A Picture Story presents its themes and imagery from an exclusively Anmatyerre and Alyawarre perspective (the exceptions are works by the Waramungu and Kaytetye artists). And, with the exception of Lyndsay Bird Mpetyane, they are all women. Accompanying the works are a selection of portrait shots taken by photographer Nick Adler. These striking photographs capture the relaxed mood of these usually shy women and the austerity of the background focuses the attention of the viewer on the individual artists. The exhibition comes from the Holmes à Court Collection, Heytesbury Pty Ltd, Perth and was accompanied by a book illustrating all works in full-colour, with photographs of the artists and explanatory texts. Sunday 28 August – Women of Utopia – Film Screening Film Australia’s 1983 documentary on the work of Aboriginal artists from Utopia – features Emily Kame Kngwarreye and other acclaimed artists, working with Batik. Sunday 04 September –Dr Garry Darby, art historian, will present an illustrated overview on the history and development of Central and Western Desert Art in Australia, with particular reference to the women artists of Utopia. There will be a discussion on the techniques of Batik and the mythology and traditions followed by exhibiting artists. Tuesday 06 September – Gallery floor talk with Christopher Hodges, Director, Utopia Art Sydney. Christopher Hodges has been involved with the promotion of Utopia artists since the late 1980s and has been instrumental in bringing their work to a wider audience. Hodges established Utopia Art in the early 1990s and has worked closely with exhibiting artists, Emily Kame Kngwarreye & Gloria Petyarre. Sunday 11 September – Wally Caruana is one of Australia’s most respected curators of Aboriginal & Torres Straight Islander arts. After twenty years at The National Gallery in Canberra, Caruana is now an independent advisor, curator & author. 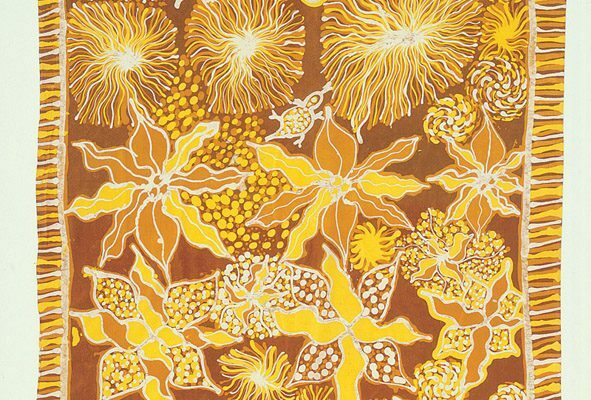 Caruana reviews the Utopia Women’s Batik Group (founded in 1977 with Emily Kngwarreye a leading force) and explains how this artistic technique, with introduced materials, began the transition from the private to the public domain for these acclaimed artists. Sunday 18 September – Adrian Newstead is Director of Coo-ee Aboriginal Art & senior Aboriginal art specialist with Lawson Menzies. Newstead gives an historical overview of the Utopia arts community and discusses the place of these unique Batik works in context with contemporary Aboriginal art. Sunday 25 September – S.H. Ervin Gallery is the setting for an afternoon of indigenous stories with a women’s voice for the final day of exhibition for Utopia, A Picture story. Terri Janke, author & lawyer, reads from her debut novel, “Butterfly Song”. Terri will be joined by Rhoda Roberts for this session.